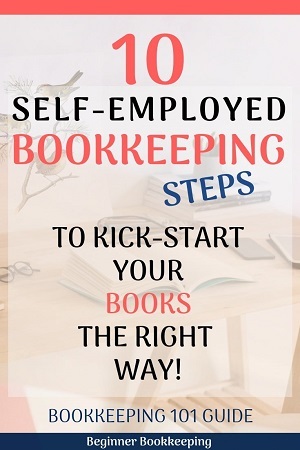 This bookkeeping 101 guide gives you 10 steps to kick-start you, a new self-employed freelancer or business owner, to track your money with the right systems and the right ideas! When you are self-employed and working to make money, you are in business – try to familiarize yourself in saying that rather than just “I work for myself” or “I freelance”. You are running a business - be proud! Every self-employed person carries out working activities to try and make money. Bookkeeping is the process of recording all the transactions resulting from those working activities. Each transaction must be identified as to what type it is, example Income or Expense. Each transaction has a financial component so once this amount is known (from a document like a receipt or invoice) it is ready to be recorded. Each transaction is recorded into the system in the identified category (called an Account) using the known amount. Afterwards, reports can be produced that show the affect of all the money coming in and going out. A bookkeeping cycle runs for one financial year made up of 12 months each year. The financial year may be different to the calendar year. For example, the calendar year is January to December but for tax purposes your financial year may run from April to March. Bookkeeping 101- Summary 1: Bookkeeping is the process of identifying the details of each transaction and recording them in an organized way into bookkeeping software for a 12-month period. 2. Is bookkeeping different to accounting? The two words are often used interchangeably meaning you could be doing your bookkeeping but if you say to someone that you are accounting, it can mean the same thing. Professional Bookkeepers are good at helping you run your day to day bookkeeping procedures, producing monthly Management Reports and advising you of the best day to day practices to help increase your profits. Chartered Accounts (CPAs) focus on taking the information from the Bookkeeper to prepare your end of year Financial Statements which fall in line with GAAP principles and taxation laws, and they file tax returns. The Accountant can analyze your numbers in depth and make sure you are getting the best taxation benefits. They can also give you advice on how to increase your profits. Sometimes there is a cross-over of duties depending on the professional’s set-up. Some Bookkeepers will file tax returns. Some accountants will do day-today bookkeeping. Bookkeepers and Accountants usually communicate and work together to give you the best outcomes and to keep the records accurate. Bookkeeping 101- Summary 2: Bookkeeping is the day to day management of the business and financial transactions. Accounting is the year-end management of the financial transactions and tax returns. The purpose of Bookkeeping for you the self-employed person is to track the movement of money in and out of your business so that you can make good decisions. Good decisions lead to a happy you and a thriving business. Having that knowledge is powerful and should help keep you motivated. Bad bookkeeping systems result in lack of knowledge about what’s going on, encouraging you to make poor money decisions which may cause your business to fail. I’m sure you want to avoid going back on the employment wagon working for a “crabby” boss. Here are some more Bookkeeping Tips to help you. Bookkeeping 101- Summary 3: The purpose of bookkeeping is to help you make good business decisions. 4. should you do your bookkeeping yourself? Do-it-yourself bookkeeping is very common for the micro business, self-employed freelancing startup, especially when on a tight budget. You must schedule in a few hours every month to stay on top of your bookkeeping. What can make do-it-yourself bookkeeping complicated are things like inventory management, imports/exports, trading in foreign currencies, operating two or more separate businesses, or your own attitude and organizational skills. If you have none of those concerns, doing it yourself should work for you. If it sounds like it will be too hard, then look for a Bookkeeper to outsource your bookkeeping to. There are lots of them out there waiting for clients like you. Bookkeeping 101- Summary 4: Do your own Bookkeeping if there are few transactions, no complicated activities and if you have the time and energy to do it regularly. 5. What is your business entity type? Your business must be recognized as an entity for operating purposes and is required by law in most countries. There are different types of entities under which a business can operate and yours will be no different. You must choose one (if you haven’t already) and, depending on your selection, go through the process of registering your legal business name, get practicing licences and anything else you need to be able to operate legally in your region. The Entity you use will determine the tax form you must fill in because the Taxation and Bookkeeping is a little different for each type of Entity. The different Entities include Sole Proprietor or Sole Trader, Limited Liability Company, Corporation, Partnership, Non-Profit, Trusts etc. Wikipedia has a list of countries and entities here so you can find yours and check it out. The Sole Proprietor/Trader form of business is the easiest and cheapest to start with because you don’t have to set up a legal company, your profit or loss will go on to your personal tax return, and there’s no regulations or bureaucratic administration to worry about (like annual meetings and recording minutes). Your personal assets however are not protected from lawsuits arising from your work or outstanding debts. 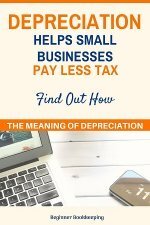 Also, because your profit goes on your personal tax return you will probably pay a higher tax rate than with a legal business which receives lower tax rates or special deductions. Bookkeeping 101- Summary 5: The Sole Proprietorship is the easiest way to start off your business activities. You can always incorporate later on. You must decide if you want to keep a single-entry or double-entry Bookkeeping system. Single-entry typically involves keeping just a Cash Book (manual or Excel spreadsheet) in which you list your Income and Expense cash or bank card payments. Single-entry is where each transaction is entered to just the one Account within the one Cash Book (one Cash Book per Bank account). This system is suited to the Cash Accounting method. Our Excel Cash Book template is a good example to use. Or you can set up a hand-written one in a school exercise book like this example. 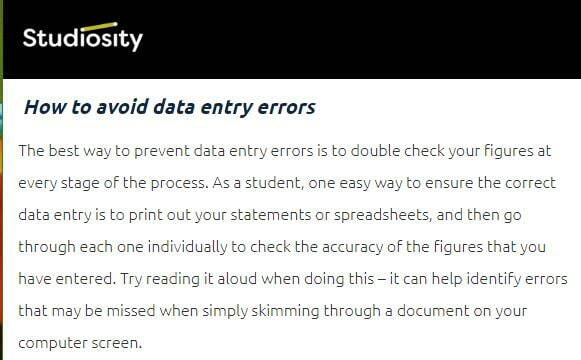 Double-entry is how all fully developed Bookkeeping software churns the data, but it’s not obvious because you get simplified screens into which you enter your transactions and you don’t get to see the double-entry going on in the background (as a self-employed person though you probably don’t need to see all that complicated accounting stuff going on). Double-entry is where a transaction is entered to two Accounts in the system and involves journals and ledgers. This system is designed for the Accrual Accounting method because you can also enter your unpaid sales invoices and bills. Bookkeeping 101- Summary 6: Single-entry enables you to do simple Bookkeeping just using a Cash Book. Double-entry requires very advanced-functioning Excel workbooks or fully developed Bookkeeping software which have journals and ledgers. It is easier to start off and learn basic Bookkeeping using Excel. If your monthly bookkeeping is simple with a low number of transactions (around 30) and no complicated stuff mentioned in Point 4 then an Excel Cash Book system will be fine. If your business is a Limited or Incorporated company, you must make sure you have an Accountant or Bookkeeper to help you produce end of year Financial Statements (using your Cash Book data) that fall in line with good accounting standards - a requirement for those types of businesses. I do recommend at least being able to prepare or access an Income Statement (also called a Profit and Loss Report) every month so that you know if your hard work is profitable or not. If it’s not profitable, you must make decisions to improve this. You can only do this after viewing an Income Statement. 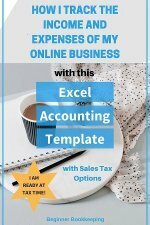 Some professionals might say that using Excel for Bookkeeping leads to more errors, but I have come across a lot of errors by small business owners in their fully developed Bookkeeping Software. These programs are not 100% full proof from entering a transaction incorrectly. Either way, it’s a learning curve and you should be prepared to put in extra time at the beginning whilst you are figuring it all out. Note: In some countries, example the UK, you will be forced to go with software that is compatible with the digital filing of tax starting with VAT, to work with the government's Make Tax Digital move. You can still opt to track your money in Excel but will require an Accountant to take your information and process it digitally. 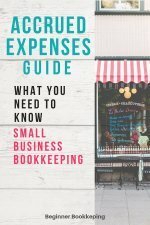 Bookkeeping 101- Summary 7: If your budget is tight and your transactions are few, you can use an Excel spreadsheet for your Bookkeeping to start with. You can upgrade to proper software when you have the money (see point 10) and when it becomes an obligation by law. Here is a list of basic activities that you might do which have a financial component. These Accounts will appear on either an Income statement (IS) or a Balance Sheet (BS) which are found on the Chart of Accounts in bookkeeping software. Your bookkeeping software should have all these accounts already in the system. If you are using a Cash Book you will have to manually enter the Account names and when calculating your profit, make sure to exclude the Balance Sheet type accounts. Here are bookkeeping procedures that surround business activities, and a rough idea of the time-frames that they should be processed. As soon as your job for a customer is finished, prepare and send the invoice – make sure to include any costs involved (such as goods or contractor fees). If you have not received some of the bills yet, then wait until they are all in before invoicing your customer, so nothing is left off the invoice. However, try not to wait for more than a few weeks to invoice your customer (it’s vital that you get cash flowing into your business). If a supplier is being particularly difficult about getting all costs to you, try and send a Progress invoice to the customer and let them know that not all costs are in yet, but you will send them the final invoice asap; or at least contact the customer to let them know what’s going on. Every day check your bank account (if you have online access) for payments received from customers who pay by Direct banking and allocate payments to your customer invoices. Once a month on about the 5th, email Customer Statements to your customers (if you make sales on credit) to show them what Invoices or amounts are outstanding – include a reminder of due date of payment. Or alternatively re-send them the invoice by itself with a gentle reminder that it is due now if the Customer is late in paying. If after a few days you still don’t receive payment, start your collection procedures to get the payment in. Follow up on these overdue payments at least once a week. As soon as you make a purchase with your bank card, keep the receipt – like, do it in the shop as you are walking out or something so that you don’t lose the receipt. Photograph it and save to an online filing system, then you can throw the original out or pop it into your physical filing system. Once a week - If you have made purchases on credit, enter the bills into your bookkeeping software (you will not enter bills when using a single-entry Cash Book spreadsheet – you will only enter payments of bills). Once a month between 1st and 10th, reconcile your creditors. This means that if you make purchases on credit, make sure you have all the invoices from the vendor. Then pay the bills by the due date. If you can’t, call them and make payment arrangements – they will appreciate you being up front and honest and it’s better than being hassled by them if you don’t say anything. If you pay at the time of purchase with bank card or cash, you will not need to reconcile creditors. As soon as you receive a customer payment by check or cash, mark it off against the invoice and deposit it to the bank account (within a day or two) so that it doesn’t get lost and so your cash flow is good. Once a month if running a creditors procedure, set up the bill payments to your suppliers either by writing cheques or setting up direct credit payments online. Most vendors have the same sort of date that their bills are due, some will expect payment earlier or later, process the payments by the due date (it will be written on their bill) which may mean you have to pay attention to this process more than once a month. Once a month (at least) you must reconcile your bank account to make sure all the transactions on the bank statement match the transactions in your bookkeeping software or cash book, at a certain date – like the last day of the month. Make necessary adjustments to get the balance in your bookkeeping system to match the balance on the bank account. Once a month from about 20th to 30th, after your receipts, payments and bank accounts mentioned above are all entered and reconciled for the prior month, look at your business reports (Income Statement and perhaps a Balance Sheet). You do not have to have received all customer payments or paid all bills to be able to produce an Income Statement or Balance Sheet. The total of those unpaid invoices goes on the Balance Sheet. a vendor asks when exactly you are going to pay your bill. Bookkeeping 101- Summary 8: The amounts from business activities are allocated to Accounts in the Bookkeeping system, and the activities fit into procedures some of which should be scheduled every month/week in your diary, so you stay on top of your Bookkeeping. A question that often has been asked is “my Income Statement says I have made a profit of $10,000 – how come I don’t have $10,000 in my bank account?”. If you want to know how much is in the Bank account – don’t look at the Income Statement. These types of payments can add up to a lot of money that's gone out the bank account that is not accounted for on the Income Statement (if you have done your Bookkeeping correctly). Another reason is that there are two types of Income Statement - cash and accrual. If you use the accrual reporting method, sales invoices for sales on credit to customers are included on the Income Statement as Income even though none of them have been paid yet – no payment equals no cash in bank. Bookkeeping 101- Summary 9: The profit on the Income Statement does not equal cash in the Bank. It’s usually best to only do this at the end of the financial year when it has been finalized and your tax calculations are complete, unless you have so few transactions that re-entering, all over again, every transaction for part of the year into the new software does not take hours and hours of time. If you move half way through a financial year and there are too many transactions to re-enter, you will find that you must look in two separate bookkeeping systems for important details – not the ideal way to operate. If moving the numbers just for the new financial year, you won’t re-enter every transaction, but you must have a Trial Balance (best option) or Balance Sheet from the previously completed financial year to get opening balances into the software. The worst-case scenario is that you start off your new financial year in the new software with no opening balances. This will only affect the Balance Sheet Accounts by not including your trading results from the prior financial year/s. The Income Statement always starts off with 0.00 balances at the start of each new financial year so that report will be fine. Bookkeeping 101- Summary 10: It’s best to only move from manual or Excel bookkeeping to fully developed Bookkeeping Software at the end of a financial year. Who Wants My Money: Your Creditors, loan providers and the tax authority. Show me the Money: Use the right income or expense account. Where’s the Money: Don’t just look at the Income Statement.